Gino Foti - Bass Guitar on "Crossing Pathways"
Cycles Of Fusion in scientific terms: Science has brought us the theory that the Fusion of elemental particles caused a reaction with amounts of energy so extreme, it led to a massive explosion creating the universe. Tons of matter were created and spread over a seemingly infinite amount of space and time. As time moved forward, some of this matter fused together to form denser objects like planets. Several galaxies were created made up of these planets, and more matter... like our sun, moons, stars etc. At some point in time, looking back, everything will have had a life span of its own. We know that the stars have a life cycle and some celestial matter will die off due to natural chemical reactions, possibly even planets., i.e. a massive celestial body like a meteor could do a planet in. As with the beginning of the universe, further fusion of chemicals or matter could spawn off newer planets or even galaxies at some point in time. In effect, we have beginnings... and endings leading to new beginnings. 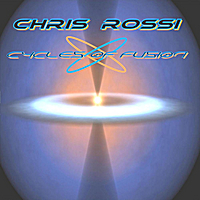 Cycles Of Fusion musically: The creation of individual compositions coming together through the Fusion of Jazz, Rock, Blues and Funk, melding a universal sound. Along with acoustic guitar and piano sounds, several classic retro-keyboard sounds were used along with sequences, arps, atmospheric synths and electric guitar with effects, at times creating "celestial soundscapes", staying true to the theme and hopefully creating something interesting to a listeners ears. Through osmosis, I channeled sounds and ideas from some of my favorite bands and musicians. In these compositions you will hear the fusion of genres, some more modern, some more reflective of the past dating back to the seventies. Reflection has dual meaning. The arps and guitar delay lend towards the title in a rudimentary sense, as well, the overall mood could be thought of as a period of reminiscing. Based around the C# Mixolydian Scale. It has a latin jazz feel, with latin rhythm patterns being used for drums and bass lines. Maybe in about a hundred years or so this will be less expensive and more common. Who knows.. maybe it even ends up a ride at Disney... in say... 2112? In the meantime, sit back, have a listen, and enjoy the ride. This one won't cost you much! This composition has a Jazz-Funk vibe within the celestial soundscape and makes use of the D Locrian, A Dorian and A Minor Scales. With a latin rhythmic base, the soundscape is set through the use of arps, synths and guitar with delay to provide... "echoes". G Minor and the Blues Scale in D. This track combines Jazz and Rock. A play on words within the concept. The track starts off with fusiony e-piano intro. Overall, the bass and rhythm tracks provide some soul to go along with more bluesy electric piano. This composition also makes use of a Joe Zawinul-esq sequence, arps, several synths and an added leslie cabinet effect to an electric piano solo. Several scales come into play. Mostly done in E using the Blues Scale, but also with E Minor, E Dorian and a section in B Dorian. More "Crossover" or Popular Jazz oriented. At some point in time, you may have met someone who had an effect on your life in some way. Looking back on the journey that has led me to this work, for me it was my friend Gino Foti. This one was actually an ode to him. Little did he know while he arranged and recorded the bass track. Thanks for your guidance, wisdom and friendship over the years G. If our paths had not crossed, I don't know if this would have happened. Using E Dorian and it's relative Minor B, this track is more Jazz-Rock based. The heavy drums and funky bass underneath lay foundation to the earth, while the use of synths, arps, sequencers and electric guitar with delay are atmospheric and trippy in nature. The G Blues Scale. A fusion of Jazz, Funk and Rock. Sometimes bad things happen for a good reason. It could be something subtle or something that hits home involving angst or heartache. When things don't go well, it can be especially hard to see "the forest for the trees", but it might just be the work of "good willed" forces in the end. The piece moves along from an unassuming open on electric guitar and acoustic piano, into a march of the benevolent forces, conveyed by the drum pattern and synth bell. I then entered into an electric guitar solo, suggesting the forces are beginning to take control. The relinquishing of power takes place, and soon the realization that this was for the greater good hits home, reflected with the use of mallets accompanied by synth pads and backing string section. The final movement is towards a more calming state of mind. Written in D Major along with it's relative Minor in B. I would consider it a fusion of Jazz with Progressive Rock. E Dorian and it's relative Minor B in Jazz-Funk. Free floating... feeling weightlessness in outer space. An arpeggiator, several synths and guitars with effects all come together to set up the soundscape. Written with the E Minor and A Dorian Scales, also utilizing the Bebop Scale in D. This one has a more modern Jazz Fusion vibe to it. Greek for Mount Olympus, Olympus Mons is located on the planet Mars and is presently documented as the largest mountain known to man. Many have pondered if we are the only beings in a vast universe. Seems unlikely. The opening electric piano chords set the tone for signal transmission, before acoustic piano comes in, leading to the heavy attack on the kick drum ringing out over the mountain tops and across the universe. Done in A Minor. This track is Jazz-Rock based. A dichotomy of terms, combining eternity or infinity with boundaries or endpoints. When pondering existence and the universe, we are left to wonder several things, like how or when it began or even ends? Science tells us some things... and religions do too. Does it really just go on forever? It would seem to be endless. Maybe the boundaries are only within our minds. Movement is from the Blues Scale in D, to D Dorian, to C# Phrygian. This track could be considered more close to that of a retro Jazz Fusion piece than others. Referencing the term unconditional love. This retro-fusion ballad opens with atmospheric synths to set the mood, before a heartfelt guitar solo moves into a chaotic section of both beauty and tension. This marked by atmospheric synths, an interesting but strange synth patch showing up in the background, and the prevailing sound of acoustic guitar chords strumming along adding levity and beauty. The next movement is into a section of melancholy feel, with the use of a moog synth patch, electric guitar and more atmospheric synths. Ending with atmospheric synths reflecting beauty, but with some tension on out to fade. Done in A Phrygian and A Minor. Bass and drum, loops and samples, were used in the arrangement from the Big Fish Audio collection named "Groove Planet". It didn't hurt that one of my favorite Joe Satriani releases was similarly titled. 'Crystal Planet'. This composition is somewhat reminiscent of Jonas Hellborg work on his 1990 release "The Word", which I found very interesting because of it's overall tone or mood, especially with orchestration used as part of the arrangements. The key of B Minor. Based on Jazz and Rock. Every second of every minute, every hour of each day... motion is happening throughout the universe. Planets rotating on their axis, moons orbiting their planets, all rotating around the sun within our own galaxy. Sometimes shifts occur within the planets causing sudden problems within. Occasional collisions in space causing matter or debris to be displaced throughout the universe. As we move along throughout our busy lives, these are some of the things happening over time we take for granted, unless we actually see their effects. The opening sequencer sets the piece in motion rhythmically. Several synths, arps, and electric guitar with delay help to enhance the celestial soundscape. In C Minor. This track is a fusion of Jazz and Progressive Rock.